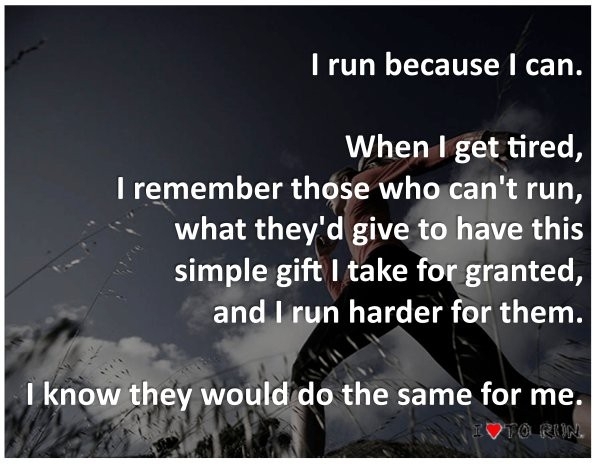 Monday Motivation: Reason for running | Fit Girl. Happy Girl. ← Trying to run a sub-30 5k? Join the club! I’ve decided to start a new series every Monday called “Monday Motivation.” No one likes Mondays, and we all know waking up for that early morning Monday run is probably the hardest run of the week. However, the way you start off your Monday determines how the rest of your week will shape up- so, enter Monday Motivation. Basically, every Monday I’ll either write up a short post about reasons to run, or maybe post a motivational image or quote, whatever it is, I hope you’ll use it as fuel for your week. For my first Monday Motivation post I thought I’d tell you a story about something that happened recently that has given me even more reason to run. People always say a reason to run is to run for those who can’t. I always thought this was a nice reason but never really had a personal connection to it until a few weeks ago. I was out with friends on a Friday night and my friend wanted us to meet a guy she had been talking to for a couple of weeks. We drove to his apartment and he met us outside so he could move his motorcycle so we’d have a spot to park. We were a group of five girls so when he got on the bike, of course we were impressed. He told us a bit about his riding experience and how much he loved his motorcycle. We went inside and my friends and I got to know him over the course of the night. His name was Chris* and he was a senior Kinesiology major, about to graduate in one month. After he graduated he aspired to become a physical trainer to help people who have been injured recover and get back to normal health. The night went on and we eventually all went our separate ways. My friend was going to see him the next day after he went on a morning ride with a few of his friends. But while he was out on his ride he got into an accident. We found out that he was in the hospital and was permanently paralyzed from the waist down. My friends and I were all in absolute shock. This was someone I barely knew, I didn’t even know his last name, and he was the same age as me, about to graduate from college, with his entire future ahead of him. Now everything he had ever wanted seemed so out of reach. I couldn’t believe that something so awful would happen to someone with such a bright future ahead of him. There’s no explanation for why these things happen but all we can do is make the most of every moment. So I run for Chris because he no longer can.